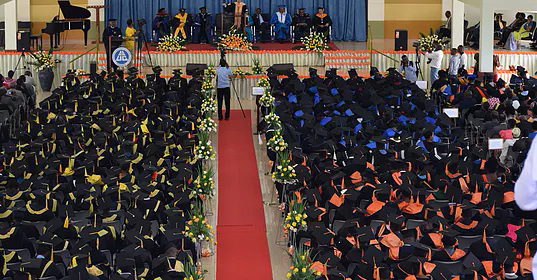 Adventist University of Central Africa (AUCA) celebrated its 23rd graduation from September 8-10. The event was unique because, for the first time, the university awarded Master of Business Administration and Master of Education degrees. A record of 675 students graduated—386, or 57 percent of them, female. The event’s guest of honor was executive director of High Education Council in Rwanda Emmanuel Muvunyi. In his remarks, he thanked AUCA for teaching the Bible along with other academic subjects. Muvunyi reminded that because of AUCA’s quality of education, it became the first private institution with students funded by the Government of Rwanda, but said the school should strive to keep improving. “I challenged AUCA to uphold academic standards by conducting technical research, adding more programs and training more Ph.D. lecturers,” he said. East Central Africa Division president and AUCA chancellor Blasious Ruguri preached an inspiring message to students. Based on the Bible story of Acts 12, Ruguri illustrated how an angel released Peter from a dungeon but left him after setting him free. After the commencement, Ruguri urged the graduates to be confident in what God can accomplish through them. He also congratulated the faculty for making AUCA a competitive university by ensuring academic excellence. Speaking on behalf of the graduates, Hirwa Dieume thanked the Seventh Day Adventist Church for establishing AUCA. He also thanked the government of Rwanda. “I thank you for a conducive environment and clear policies,” Dieume said. Adventist University of Central Africa was established in 1978, but its official opening was held on October 15, 1984. The school was located in Mudende, om Gisenyi Prefecture. In 1994, just before the genocide in Rwanda, the University had seven faculty members. Currently, the university operates on a new campus at Masoro, in Gasabo, Kigali. The school is committed to achieving its complete development and expansion as a world-class Adventist institution of higher learning.